If it weren't so perfect right where it is, this old barn window, and some of the surrounding siding, would make a great American folk art museum exhibit. The glass itself is a mystery, though excess paint may have been wiped off with a rag, and therefore adhered to the wavy antique glass. The window frame has been repainted with no attempt to sand or scrape the warped layers below, creating a mottled affect that would be difficult to replicate. The curtain? Perhaps an old flour sack or kitchen dish cloth, though why one needs a curtain up there is unknown. But it adds to the window's folksy aesthetics. The hinges on the casement windows are no doubt painted solid. 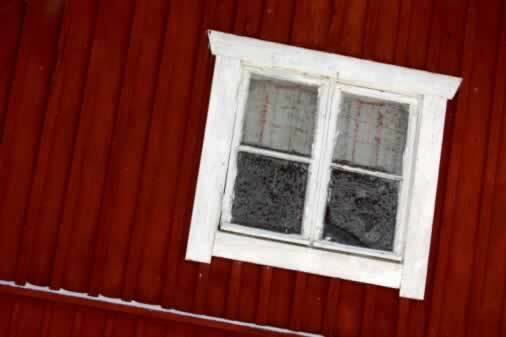 The white window frame looks as if it was hand sawn from what we would now call "old barn wood." One must admire the perseverance in keeping this most delightful relic painted, if nothing else.